PM, US Ambassador mark 1 year since President Trump recognized Jerusalem as the capital of Israel. 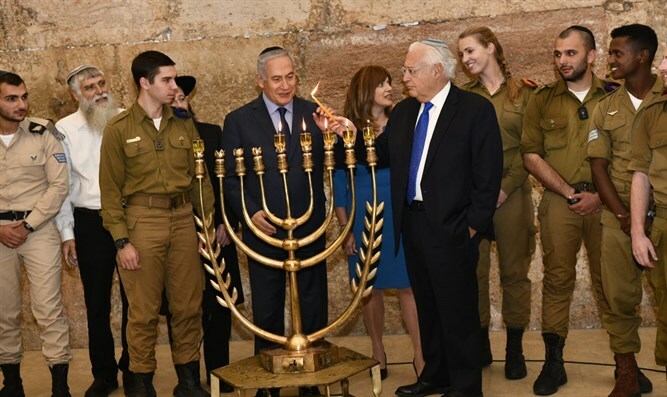 US Ambassador to Israel David Friedman and Prime Minister Binyamin Netanyahu attended the candle-lighting ceremony for the fifth night of Hanukkah at the Western Wall on Thursday evening. The meeting also marked the one-year anniversary of US President Donald Trump's recognition of Jerusalem as the capital of Israel. Prime Minister Netanyahu said at the ceremony: "There is a great victory, perseverance and great continuity of our people, which overrides all the rules of history with the force of faith and the will of our people. Today we celebrate 70 years since the reestablishment of the State of Israel. The power of this spirit that is expressed throughout the world in the rising status of Israel in the world, in the special power that is projected here into the Middle East, Arab and Muslim countries, here in the Middle East, Africa, Asia and elsewhere." Netanyahu added, "I must add here the tremendous support we receive from the US government and its president, Donald Trump, Exactly a year ago he made a historic decision because it is of historical importance and because it has recognized history. It is impossible to promote peace on the basis of lies and the end of a policy based on lies. President Trump, in a courageous and genuine move, recognized what we know has existed here not only since the time of the Maccabees, but since the time of King David, 800 years before, the recognition of Jerusalem, our heritage and the connection that no other nation. This is the truth, and the truth is the basis of all and the basis for peace."